Light pollution, also known as photopollution or luminous pollution, is excessive, misdirected or obtrusive artificial light. Light pollution is a broad term that refers to multiple problems, all of which are caused by inefficient, unappealing, or (arguably) unnecessary use of artificial light. Specific categories of light pollution include light trespass, over-illumination, glare, light clutter, and skyglow. Light trespass occurs when unwanted light enters one's property, for instance, by shining over a neighbor's fence. A common light trespass problem occurs when a strong light enters the window of one's home from the outside, causing problems such as sleep deprivation. Over-illumination is the excessive use of light. Specifically within the United States, over-illumination is responsible for approximately two million barrels of oil per day in energy wasted. Glare from unshielded lighting is a public-health hazard - especially the older you become. Glare light scattering in the eye causes loss of contrast, sometimes blinds you temporarily and leads to unsafe driving conditions, for instance. Light clutter refers to excessive groupings of lights. Groupings of lights may generate confusion, distract from obstacles (including those that they may be intended to illuminate), and potentially cause accidents. Clutter is particularly noticeable on roads where the street lights are badly designed, or where brightly lit advertising surrounds the roadways. Skyglow refers to the glow effect that can be seen over populated areas. It is the combination of all light reflected from what it has illuminated escaping up into the sky and from all of the badly directed light in that area that also escapes into the sky being scattered (redirected) by the atmosphere back toward the ground. Degradation of photic habitat by artificial light. Alteration of natural light levels in the outdoor environment owing to artificial light sources. Light pollution is the alteration of light levels in the outdoor environment (from those present naturally) due to man-made sources of light. Indoor light pollution is such alteration of light levels in the indoor environment due to sources of light, which compromises human health. 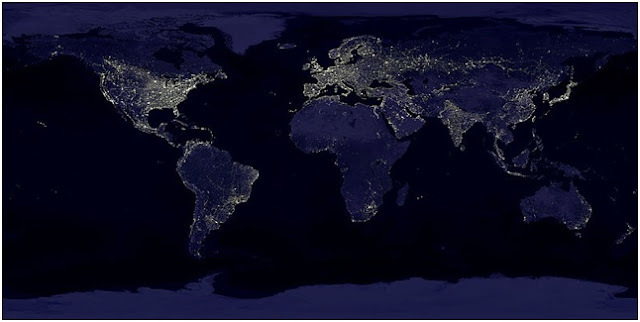 Light pollution is the introduction by humans, directly or indirectly, of artificial light into the environment. In disrupting ecosystems, light pollution poses a serious threat in particular to nocturnal wildlife, having negative impacts on plant and animal physiology. It can confuse the migratory patterns of animals, alter competitive interactions of animals, change predator-prey relations, and cause physiological harm. The rhythm of life is orchestrated by the natural diurnal patterns of light and dark; so disruption to these patterns impacts the ecological dynamics. With respect to adverse health effects, many species, especially humans, are dependent on natural body cycles called circadian rhythms and the production of melatonin, which are regulated by light and dark (e.g., day and night). If humans are exposed to light while sleeping, melatonin production can be suppressed. This can lead to sleep disorders and other health problems such as increased headaches, worker fatigue, medically defined stress, some forms of obesity due to lack of sleep and increased anxiety. And ties are being found to a couple of types of cancer. There are also effects of glare on aging eyes. Health effects are not only due to over-illumination or excessive exposure of light over time, but also improper spectral composition of light (e.g., certain colors of light). Over illumination can constitute energy wastage, especially upward directed lighting at night. Energy wastage is also a waste in cost and carbon footprint. 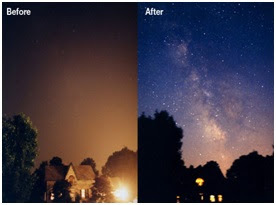 The good news is that light pollution can be reduced fairly easily by shielding lights properly, by only using light when and where it is needed, by only using the amount that is needed, by using energy efficient bulbs, and by using bulbs with appropriate spectral power distributions for the task at hand. A composite satellite image of Earth at night in 1994–95. A similar image from 2012 illustrating the growth in light pollution. · Utilizing light sources of minimum intensity necessary to accomplish the light's purpose. · Turning lights off using a timer or occupancy sensor or manually when not needed. · Improving lighting fixtures, so that they direct their light more accurately towards where it is needed, and with fewer side effects. · Adjusting the type of lights used, so that the light waves emitted are those that are less likely to cause severe light pollution problems. Mercury, metal halide and above all first generation of blue-light LED road luminaires are much more pollutant than sodium lamps: Earth atmosphere scatters and transmits blue light better than yellow or red light. It is a common experience observing "glare" and "fog" around and below LED road luminaires as soon as air humidity increases, while orange sodium lamp luminaires are less prone to show this phenomenon. · Evaluating existing lighting plans, and re-designing some or all of the plans depending on whether existing light is actually needed.